Garrett who is over 6’8” plays Frankenstein, not a character that jumps to mind when you think about Christmas. The spot opens with Frankenstein recording a music box playing a holiday tune using Apple’s Voice Memos app. Frankenstein leaves his mountain home for the town in the valley below. As he leaves, he picks up a package that he takes with him. A large group is gathered in the town square around a Christmas tree. They are startled to see Frankenstein who walks to the base of the tree, opens up the package he brought along with him, and removes Christmas lights that he screws into his neck. 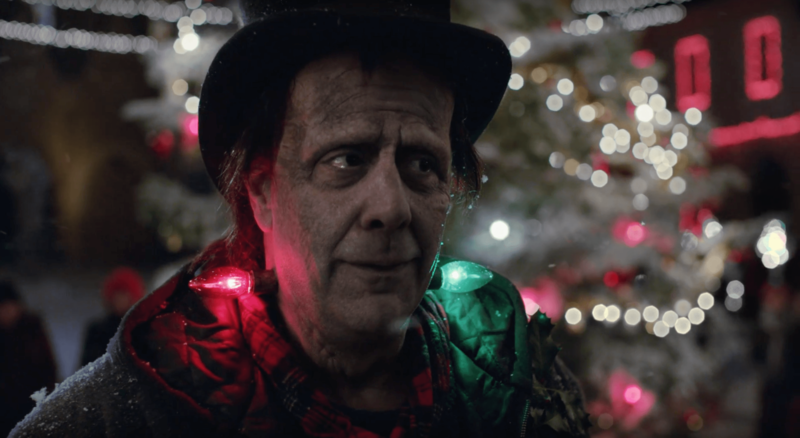 As the bulbs light up, Frankenstein plays the music he recorded on his iPhone, ‘There’s No Place Like Home for the Holidays, and begins to sing. One of the bulbs goes out and it seems like Frankenstein is going to give up on his performance when a little girl helps him by fixing the misbehaving light and joining Frankenstein and the rest of the crowd in singing the song.